A property in Gloucester Crescent in Staines has been granted a full Closure Order following reports of anti-social behaviour and drug dealing. The property in Staines was used to distribute illegal drugs, which in turn led to anti-social behaviour and violent crime in the area, having a detrimental effect on the local residents. The full Closure Order was granted yesterday (13 March) thanks to the hard work and extra evidence provided by the Spelthorne Neighbourhood team. The property will remain closed until 13 June, 2019. Spelthorne Borough Commander T/Inspector Maxine Cilia said; “This is a brilliant result for the local community who have suffered years of drug related anti-social behaviour which at times has escalated to violent crime. 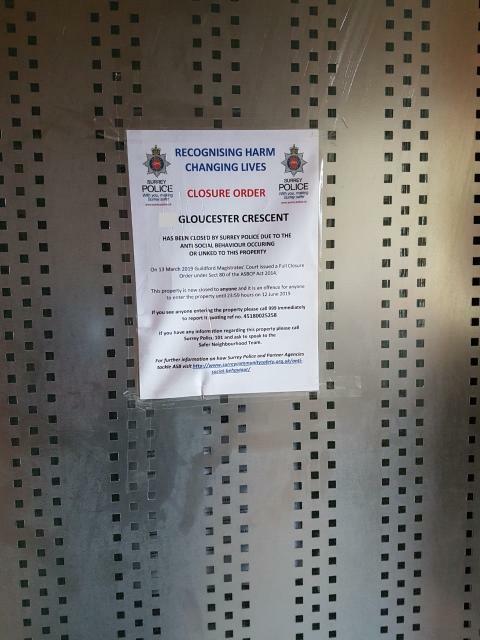 “The team has worked together to bring this case to a successful conclusion, and their problem solving and community centred approach has meant that the residents of Gloucester Crescent can live their lives without having to endure any more criminal activity. “Thanks to the local residents and the information they provided we were able to apply for the closure order. The residents were living in fear of violent crime and frequently endured nights of noise and anti-social behaviour. Thankfully, that has now been put to a stop.